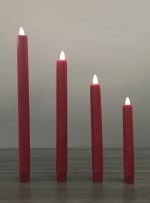 Flameless candles, as an electronic alternative to traditional wick candles, are battery-operated, and they come with a waxen appearance that gives the impression of being a real candle, except that the flame is a small bulb. Some of the candles have lights that twinkle instead of burning constantly to give the appearance of an open flame. 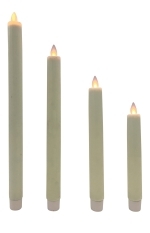 Flameless candles are a safe alternative to real candlelight. They can be used throughout the home in bedrooms, living rooms, dining rooms, and bathrooms—any place you would use a real candle. Many people use flameless candles as nightlights too. 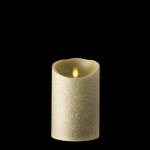 Flameless Candles come scented (serving as air fresheners) or unscented in a range of colors and scents. 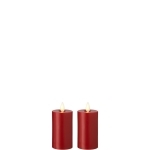 Flameless Candles are also offered with timers so you can set the length of time for them to "burn." Flameless candles don't give off smoke, soot, or melted wax, making them a cleaner option to real candles. With no open flame, the potential as fire hazards is reduced. 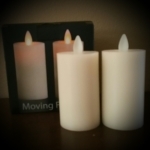 Twigs Candles is pleased to offer these attractive flameless candles. You will also like our Radiance Lit Pictures!